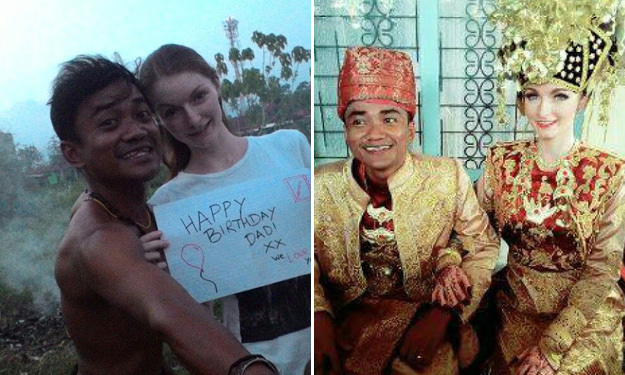 An "average-looking" Indonesian got male netizens envious when he posted photos of him with a gorgeous British woman he married recently. Bayu Kumbara is considered as one of the luckiest guys on Earth for having captured the heart of his beautiful wife, Jennifer Brocklehurst, who hails from the United Kingdom. He has been described on social media and blogs as a "man with a funny face." On the other hand, many likened his better half to a doll; some even called her a "goddess." Love is really blind, isn't it? The couple first met while spending a vacation in an island, MADPANDANEWS reported. They fell in love with each other and eventually sealed their relationship with marriage. Another online source said they are now living a simple yet happy life. So if you're a woman who hasn't found true love yet, follow this classic advise: Try to look beyond a person's physical appearance.